Saving Lives and Souls Foundation – Page 8 – Saving lives through instructional videos, saving souls with the gospel of Jesus Christ. While some will run from an active shooter that has gotten into the church, others may not be able to get out, and they may need to hide. Hiding sounds like an easy task, but it could prove difficult when gunshots are ringing out around you..
Of course, you can hide behind walls, but there are a few things to remember. First, most walls (unless a masonry wall) do little to stop bullets. Having said this, if you can find something solid to hide behind (e.g. like a metal or wooden desk, under a wood based table), then it will again increase your chances. In most instances, if you are hiding well enough, and you are quiet enough, the attacker will not know you are there. It is safer to hide behind a wall where they may not see you is safer than not hiding at all. The exception is if they are familiar with the church. Someone familiar with the church will probably know all of the potential hiding spots. If you do hide in a room, you should do your best to secure your immediate area. This may include locking the door, and if it can be done quietly, move objects in front of the door so that if they attempt to kick it in, the door with items against it should keep them out. If at all possible, quietly barricade the area using desks, filing cabinets, furniture, etc. After you finish locking or barricading the door, NEVER position yourself directly behind the door, especially if it is a hollow core door. This is a recipe for death in an active shooter situation. Hollow core doors won’t even stand up to a fist, and a bullet probably would not even slow down after going through most hollow core doors. If it is a glass door, and the shooter hasn’t noticed it yet. shut the lights off (like it is not occupied), and hide out of site of the glass. DO NOT stack furniture or filing cabinets against a glass door, because this will tell the shooter you are there. Once the door is locked and/or blocked, turn off the lights. You want to give the impression to the shooter that nobody is inside the room, so he shouldn’t waste his time trying to get in. If possible (without drawing attention to the huddleshooter), close the shades or curtains, and stay out of the view of those windows. If possible, call 911, but don’t do it if the shooter may hear you talking. Keep quiet, and keep all of your technology quiet. Shut off or turn cell phones to silent mode. If you have a computer running, hold the start button so it shuts down without making a sound, if you are a volunteer fireman (or someone else carrying a pager), shut it off. Think of anything that might make noise in that area, and shut it off. You do not want to alert the shooter that someone is in that room. If possible, lay on the floor. It is also important not to huddle in a group, but spread out. Recent research has shown huddling together allows the shooter to do more damage because they shoot into a crowd and injure more people with less effort. When bunched up, the shooter is at an advantage. All to often, we hear about what an active shooter was doing before they committed their crime. Houses of worship often see these signs, but yet they are oblivious to them. It’s time to quit missing these signs, and start paying more attention to what is going on in their lives. Sometimes domestic problems spill over into the sanctuary, and even if the congregation is not shot up, at least one person dies. I remember several over the years about instances where a husband and wife were splitting up, or having marital difficulties, and it turned into a church shooting. In one instances,I can remember the wife went to church, and the husband showed up at church and shot their spouse. In most instances, the shooter commits suicide, but not always. The only reason I am mentioning this is so you have a reminder that it is not always about the entire congregation. Sometimes it is about a domestic issue at home, and it spills over into the church. As I did on Thursday, I am sharing some more information from handouts that I provide when I teach Surviving and Preventing Active Shooters and Bombers in Houses of Worship. For the safety of yourself and all those in your house of worship, PLEASE think about these signs and think about anyone that might be having these issues. Past active shooters had common attributes. For these attributes to be included in this list, it had to be present in at least 25% of the active shooters life history. While these signs may not indicate they will become an active shooter, they should cause individuals that may become victims to have a raised awareness. These are similar to the first list that I published, but still a little different. If there are indications on the first list and the second list, then you should have substantial heightened awareness around these individuals. Active Shooter – What should we do? 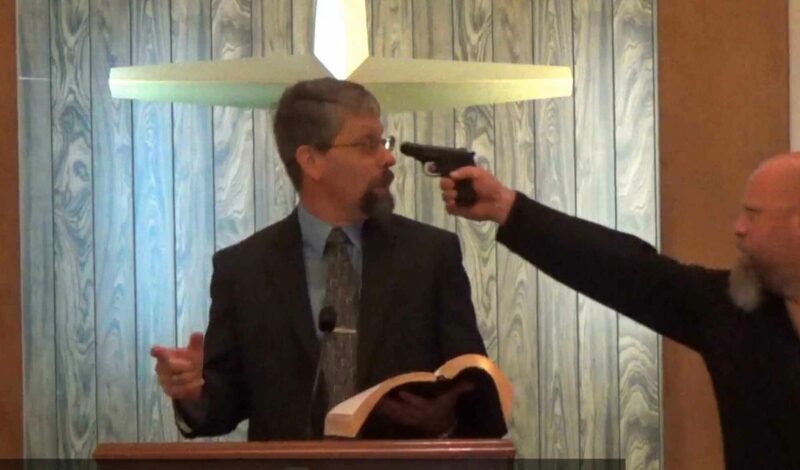 I have many church leaders ask “What should I do if an active shooter gets into my church”. While it is a horrible thing to imagine, there are things you can do to increase your chances of surviving. The first thing that I would like to do is refer you to the Run, Hide, Fight video. This video was created by the City of Houston, and the Department of Homeland Security. It provides some very good basic tips on how to survive an active shooter situation. I strongly urge you to watch this video before you continue reading this blog. Hopefully, you have now seen the basics of what to do in an active shooter situation, I want you to imagine, or look at, your church and ask yourself a few questions. How can I escape? Where could I run to? Where is the appropriate place to go if you do escape? You should begin considering areas that will physically hide you, and an area that will put a barrier between you and any projectiles coming your way. While there are many self-proclaimed ballistics experts out there that may say that I am wrong, I am a firm believer that even if it only slows the projectile down, it gives you a better chance of surviving. This will depend on the caliber and ammunition they are using, but if someones shooting at me, I am not going to stand in the open when I could be behind cover. Having said this, hiding behind objects that offer no stopping or slowing power will not work. Plain sheet-rock walls, hollow-core doors, paneling walls, and other easily penetrable construction materials will provide little cover. An easy way to guesstimate if an object is potentially sound enough to stop a bullet, is to imagine what a hammer with a full swing would do to that object. If it will smash and go through the object you’re considering, then that is not a good place. If it would cause very little damage, then you probably found the right place! So back to considering your church: Do you have a dumpster to hide behind? The steel in a dumpster should slow or stop a bullet, depending on the caliber used. What about an brick or block wall? Most bullets will not penetrate brick or block walls! Are there cars in the parking lot to hide behind? Hide behind them. Do you have large rocks or boulders outside? Hide behind them. A church bus, a church van, even a church garage or shed might work. Sitting at my computer, I cannot tell you where your best places to hide are, so you are going to have to make that decision. Depending on the circumstances, it may be better to fall to the floor, and then use those solid wooden pews as cover. Anything that puts a substantial barrier between you and the shooter is a “good thing”! If the shooter is moving up the aisle, there is always the option of crawling under the pews and working your way to the back of the church, or towards an exit door. If you do get to the back of the church, or an exit door, you might be able to escape behind the shooter, or hide behind them. I have attached a video to this blog. This is a scene from the instructional video that Saving Lives and Souls is creating and this instructional video should be out in July of 2018. This should give you a better idea about crawling under pews and how to possibly get close to an exit. It is important to note that you will have to make the decision what to do. In order to make that decision quickly, you have to be in a situational awareness mindset. Know your surroundings, and regularly play scenarios out in your mind. Remember, there is no guarantee what will work as cover after you escape, and what will not. I am only providing these tips so you might realize that you have more options than when you started thinking about surviving an active shooter. Once you run from the area, and you are safe, call 911! Even if you saw someone else on their phone, it does not mean they were calling 911. They may have been calling loved ones. Perhaps they called 911, and the call may not have connected. As someone that served in public safety for over 25 years, I can tell you that when the dispatcher tells us there are multiple calls coming in, it lets first responders know that it isn’t a hoax or prank call. While we may be en route with the first call, multiple calls add even more urgency to the response. One of the keys to surviving an active shooting is to have situational awareness. Situational awareness is being aware of what is going on around you. We have to keep our eyes wide open and observe what is going on, and we need to follow our gut feelings. If something doesn’t seem right, if someone gives you a creepy feeling, or if someone makes the hair on the back of your neck stand up, we should not ignore it! We need to be aware of that person, and depending on the situation, make others aware of this individual while not letting them know that they are being watched. Even those that are not part of an organized safety and security team in a church should be aware of behaviors that might be concerning. As the Department of Homeland Security says, “If you see something, say something.” That an important factor in preventing church violence. Shootings happen so quickly! If you do not have situational awareness prior to gunfire, it may be too late already. Many have said one second everything was fine, and the next second they heard gunfire. Try this exercise, snap your fingers and then see how long it takes you to escape the room you are in. Even if you gain two additional seconds through your situational awareness, those two seconds can save yours ,and possibly many other lives. In my home church, we took it several steps further. We installed security camera’s that can see anyone trying to come in. These cameras also have day and night vision, so the time of day will not matter. The sound engineer monitors the cameras, and where I sit, I can also monitor them from across the room. Our Pastor wanted the church to feel inviting, and was worried about someone possibly coming late to church, only to find a locked door. For that reason, we installed an electromagnetic door lock on the front door. With a flip of the switch, the doors can be locked before the shooter ever gets to the door. Of course, this doesn’t guarantee that they won’t get in, but it sure gives us a fighting chance. Have you ever wondered about the the common attributes of an active shooter? Well, I wondered it many times, so I spent two years researching and looking at others research. In 97% of the cases, the people that committed active shooting in the United States had some very common attributes. The list I am providing is just the basics. As time goes on, I will reveal more attributes of how to identify potential active shooters, and when you should be so concerned that you call the police immediately. I don’t want to overwhelm you with all of the lists at once. As you read through these attributes, think of the individuals who fit these attributes, and start thinking about who you may want to watch more closely. The information below is part of a handout that I provide when I do consulting jobs and the Surviving and Preventing Active Shooters and Bombers in Houses of Worship. Just a quick note to say that the new Saving Lives and Souls website is live! It’s a good thing too. We’ve got a lot of work to do.